Move to the sensual rhythms of Latin America Vibes. 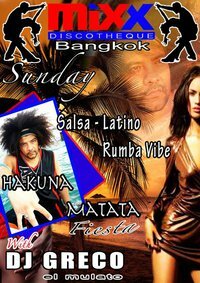 Learn how to move your body like a real BAILADORA and BAILADOR with the Flavor of GRECO from Cuba the best Latino Dance Master IN ASIA. HAKUNA MATATA CON GRECOOOOOOO !!!! The Best of The Best @t Mixx Discotheque.